Granada Ventures presents eight of the best episodes of British Television Drama ever shown on TV. 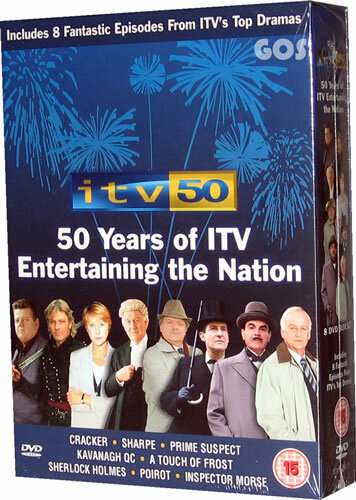 This 8 Disc box set contains eight of the best independent episodes from ITV's top shows. Starring a host of top talented actors such as Robbie Coltrane, Sean Bean, Helen Mirren, John Thaw, David Jason, Jeremy Brett and David Suchet. This is a fantastic opportunity to acquire a top quality box set of British TV Drama at its very best. A great introduction to international buyers interested in sampling a variety of top UK shows and a great gift idea. Each Episode contained within this box set is described below. ...Sharpe's mission is to go behind enemy lines to fin James Rothschild, an undercover agent. He enlists the help of two Spanish partisans, but who are these shadowy figures ? and are they on Sharpe's side or Napoleon's ? USA and Overseas Buyers: - Please Note that this DVD is Region 2 and the format of the DVD is in PAL. This means that your playback equipment must be code free and able to handle PAL format. Make sure you check your DVD player and TV to make sure before buying.